The Salesian Sisters of Cambodia celebrated its 24th Graduation Ceremony for the three vocational training centres namely, Don Bosco Teuk Thla, Tuol Kork and Battambang for the schoolyear 2017-18 on 21 July (Saturday) at the Don Bosco High School Hall in Teuk Thla. 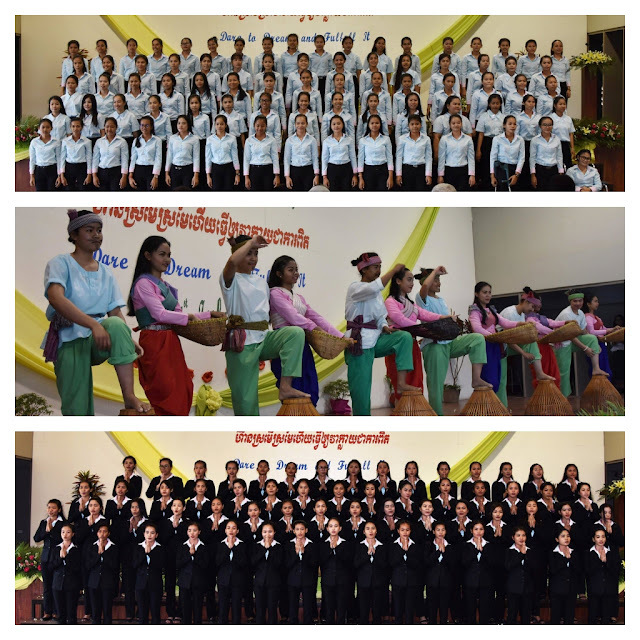 Students turned professional secretaries, experts in Food Technology and Hotel Services and excellent in sewing received their certificates after having completed one year (for the sewing course) and two years (for FTHS and Computer-Secretarial course) of rigorous training where students acquired knowledge and skills through seminars, classroom discussions, ethics and value education, internship program, group activities, workshops and many more. 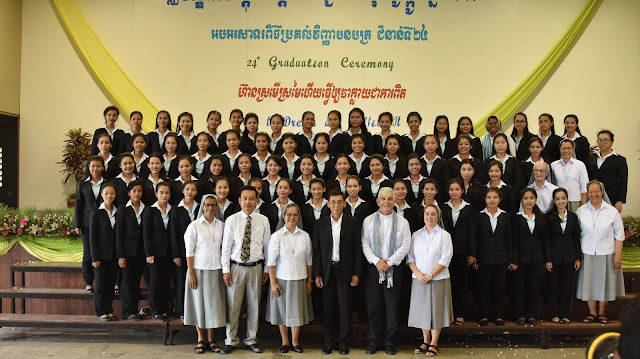 A total of 93 students were awarded their certificates at the Graduation ceremony, out of whom 61 are from the Computer Secretarial course, 24 trained in Food Technology and Hotel Services and 8 have done their one year training in sewing and dress making. 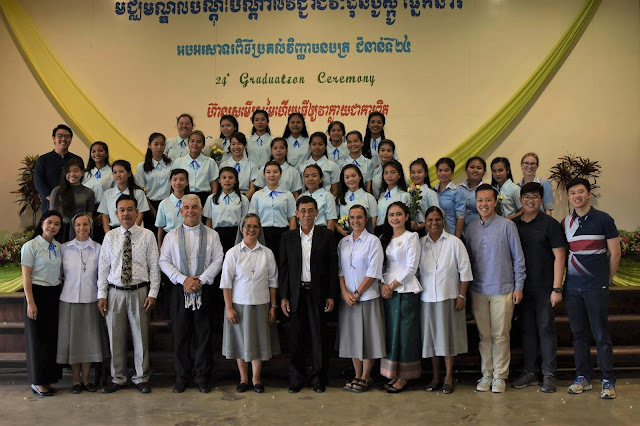 The event was graced by Dr. Bun Phearin, President of National Polytechnic Institute of Cambodia, who delivered the graduation address to the graduating students. Also present at the ceremony were Msgr. 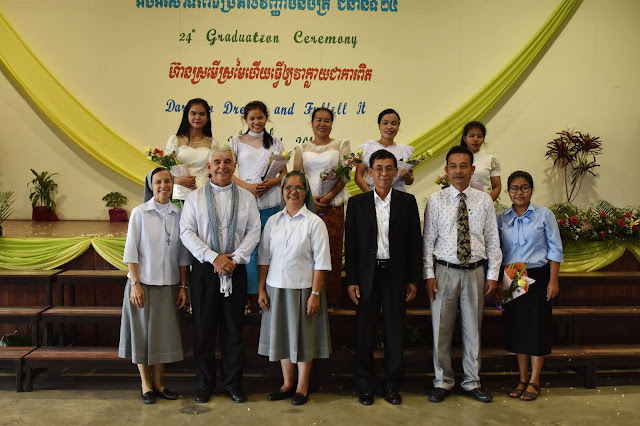 Enrique Figaredo of the Vicariate of Battambang, Sr. Jessica Salvaña, Provincial Superior, Daughters of Mary Help of Christians, Cambodia-Myanmar, Sisters, staff, students and the parents of the graduating students. 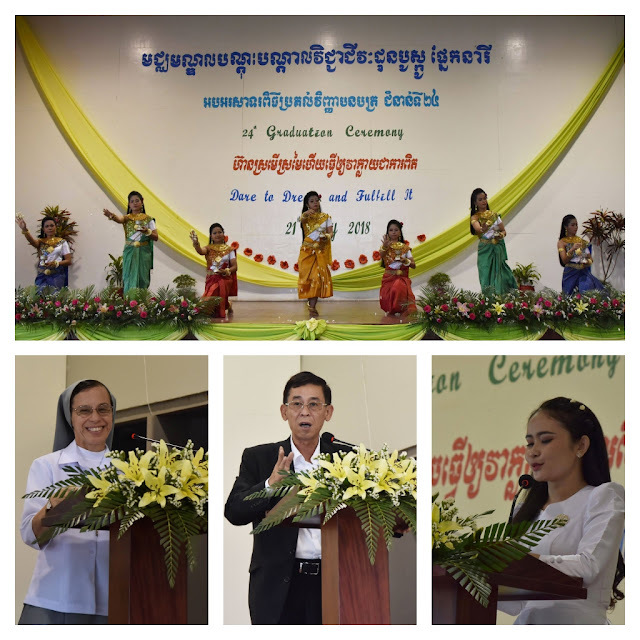 As the graduates eagerly waited to take their certificates, the event started with the blessing dance. 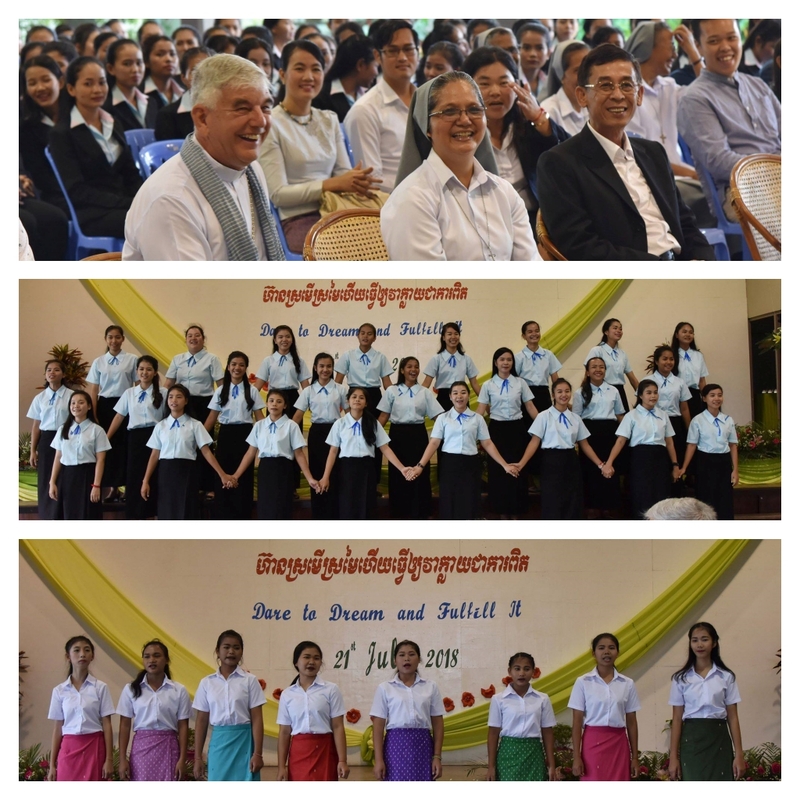 The ceremony continued with Sr. Amanda Alvarado, Vicar of Don Bosco School Teuk Thla, welcoming the guest and presenting the annual report where she highlighted the Institution’s performance and achievements of the students. 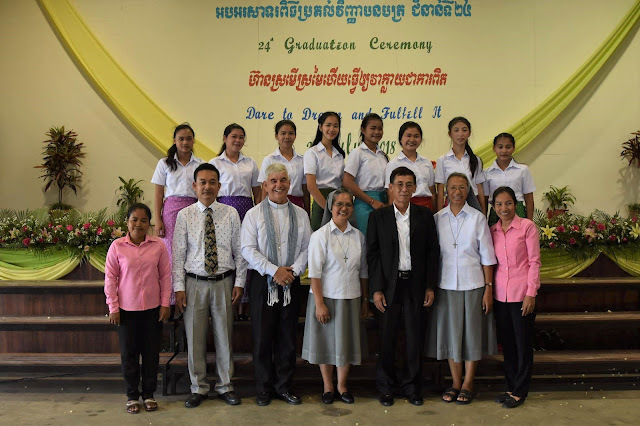 Honorable chief guest Dr. Bun Phearin handed over the certificates to the graduates of Tuol Kork, Msgr. Enrique Figaredo to the graduates of Battambang and Sr. Jessica Salvaña to the FTHS graduates of Teuk Thla. 8 women who completed their adult literacy programme I and II level at Teuk Thla and Toul Kork were awarded the certificates from the Ministry of Education. The ceremony ended with the speech of Miss Yeun Makara who expressed the gratitude of all the graduates. It was such a joyous occasion celebrating the success of the graduates who worked their way out to reach their dream.